I’m a great supporter of, and volunteer fundraiser for, the Rabies Challenge Fund. Here are preliminary results of the current study. 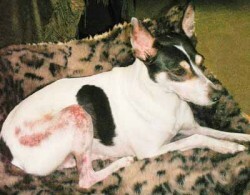 A study conducted according to the USDA Title 9 canine vaccine licensing standard, was begun more than five years ago. The purpose was to determine if the duration of immunity from commercially available rabies vaccines was longer than 3 years, with the goal of extending state-mandated rabies boosters for dogs to 5, and then 7 years. The first rabies vaccine studied was selected based on the superior response it provided in the USDA challenge trials for licensing. Another licensed rabies vaccine was administered to a second, separate group of dogs 2 years after the first study began so that a minimum of two commercially available rabies vaccines would be tested. The second vaccine selected is the one currently administered to a very high percentage of dogs. Both vaccines demonstrated excellent protection based on antibody testing for each of the first three study years. However, fewer than 30% of dogs in the first vaccine group, now five years since vaccination, had serum rabies antibody titer levels considered positive on the Rapid Fluorescent Focus Inhibition Test (RFFIT). (Note: RFFIT is the rabies titer standard established by the Centers for Disease Control within the USA [0.1 IU/mL] and the World Health Organization [0.5 IU/mL] for export to other rabies-free locations to be adequate to protect humans, not dogs, against rabies. There is no established standard for dogs, which means that the human standards must be extrapolated when assessing protection for other species.) Some of the dogs with low or no detected RFFIT antibody were further tested to determine if they had “immunologic memory”. This in vitro test shows whether memory is present or not, even in cases when serum antibody cannot be detected at a level considered to be protective. The results of this further testing indicated that most of the dogs vaccinated five years ago, even without a positive RFFIT, do have “immunologic memory”. As soon as a USDA licensed facility can be reserved, we plan to challenge some of those dogs with rabies virus to determine if the memory response demonstrated actually correlates with protection. Our conclusion from studies with the initial rabies vaccine is that the immunity conferred by that product, and assessed by the in vitro RFFIT, was excellent for the first three years, but declined during the fourth year, and continued to drop during the fifth year. The second vaccine group, which is now three years from vaccination, will remain on study for at least two more years. Principal Investigator, Dr. Ronald Schultz of the University of Wisconsin School of Veterinary Medicine, is preparing results of the study and details described above for scientific peer review and publication. That data will be made available to the public as soon as our paper has been accepted for publication. After completion of the peer-review process, it is our hope that this data will establish the world’s first canine rabies titer standard. If this data is further verified by challenge, it will provide a solid scientific base enabling states to incorporate titer clauses into their laws.